Tengboche monastery with Tawuche peak. Kongde peak seen from Namche bazaar. 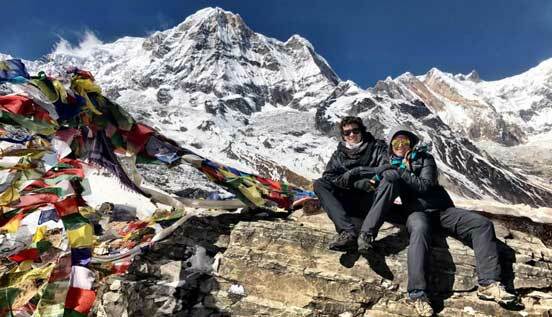 Short trek in Everest national park visits Shepra villages and monasteries, closely observing their lifestyle and culture crafted in harmony with some of the highest mountains in the world. This is the best way to get the dipper perception of Everest national park as UNESCO Heritage site. The short Everest trek starts with a 35 mints spectacular flight from Kathmandu, Nepal. From Lukla the trail heads up north through the Tibetan Buddhist Sherpa villages. Namche at 3,440m has several Everest view points and scenic walks. Namche Bazaar was famous trading place between Nepal and Tibet. Still Tibetans come to Namche Bazaar with the yak caravan. Tengboche monastery is a largest monastery of the region, perched at a ridgetop of 3,870m. Tengboche is popular for the sunset view of Mt Everest. 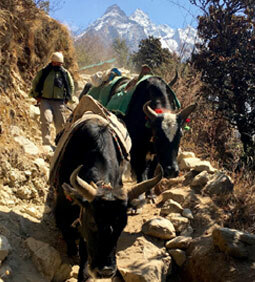 Short Everest trek could be customized for 6 days as deluxe and luxury trek or as pony trek. This also makes a perfect trek for family with kids. Day 01 : Fly along the eastern Himalayas to Lukla (2,800m). A short easy trek (4 hours) to phakding is brilliant with Himalayan view and alpine settlements of Sherpa. Day 02 : The trail follows the 'Bhote Kosi' river up north crossing over suspension bridges to the base of Namche Bazaar. The trail then climbs for about 3 hrs. We get the first view of Mt. Everest on the way. We formally enter into Everest National Park on the day. (5-6 hours). Day 03: Rest for acclimatization. A sort, easy walk could be planned for better acclimatization. 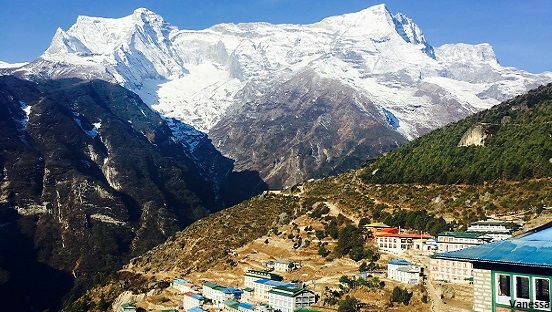 Khumjung above Namche is beautiful Sherpa village with Sir Edmund Hillary school. The syangboche ridge on the way is overlooking at the Himalayan Peaksincluding Everest, Amadablam and Thamsherku. Day 04: Tengboche. (6 hrs) The trail to Tengboche follows contour from Namche and then descends to the Dudh Koshi River before climbing again to Tengboche Monastery (3,870m). Day 05: Tengboche offers magnificent view of Everest and Amadablam. From here we return back to Khumjung village. Visit Khumjung monastery and Sir Edmund Hillary school. The khumjung monastery possess unusal scalp claimed as 'Yeti Skull'. Day 06: Trek down to the valley and back to Phakding. Day 07: Trek back to Lukla and prepare for flight next day (4 hrs). Water : You can buy bottled drinking water thorughout the trek. Hot water for drinking will cost as much as tea. If you are planning to filter or purify our own water, carry two water bottles. Most purifier takes time to disolve and work. Personal expenses : You will need about USD 150 - 200 for the personal expenses during the trek. Even though USD could be easily changed throughout the trek, Nepalese Rupees would be much easier. You will need this amount for bottled water, drinks, beverages, chocolates and toiletries. The amount will also cover standard tipping for guide and poter. Insurance : Insurance of guide and porter are covered by the compnay. However clients have to have their insurance. Sprained ankle, altitude sickness, food poisoning, respiratory infections will make it difficult to trek back for days. Helocopter is the only way to get trekkers out of the mountain which might be very costly. So it is better to have right insurance covering helicopter evacuation from the altitiude of 3,800 m.
Tips : Please note, service charges in hotel and restaurants are already included and paid. Tipping guide and porter is the way of appreciating the job they did. The standard tipping is USD 10 / day for guide and USD 6 / day for porter. The amount is not per person but is shared by the group. Daypack – 15 – 30 lt for you to carry, water and other essentials for a day. Note: 30 litre duffle bag will be provide by the company. Down jacket is required only for the month of January – February and also for trek going above 3,500 m.
Short Everest trek could be done using deluxe or luxury lodges. Short and easy Everest experience trek to Namche could be planned for 6 days based on deluxe or luxury lodges. Also the option of Pony trek is available. Write us to custom make the Everest trek for your family and friends. 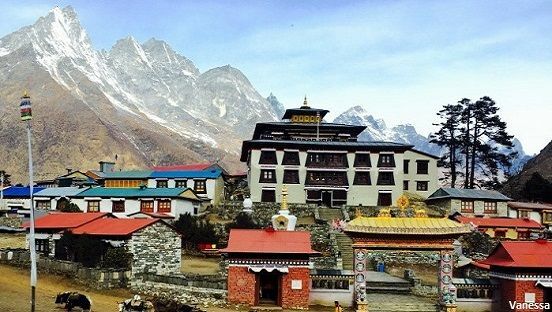 Join Tengboche monastery trek for Mani Rindu festival from 25 - 27th 2018. Great experience to approach the top of the world, Tour planning and guide were perfect and tailored to whatever you needed. I wanted to thank you and your team for helping to orchestrate a very memorable trip to Nepal. You recommended great lodges along the Everest trail and succeeded in arranging a trekking guide in Lukla despite the short notice of my visit. 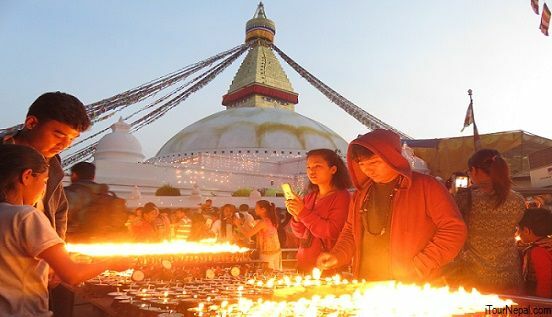 You and your team also provided very insightful tours of Kathmandu Valley, delving into cultural and historical significance of locations that made the stay much more meaningful. I also appreciated your timely and detailed responses to all my questions during the planning period of the trip. You provide a very hands on approach that sets you apart from competition. There is so much to see in Nepal, and I am ready for a return visit ! 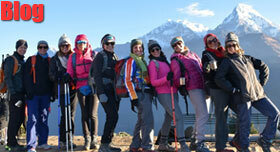 Read Vanesssa's blog on short Everest trek with us. 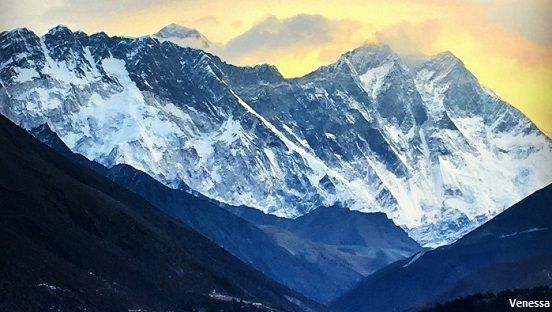 Just 12 days to see the world's most poplar trek to Everest base camp from Kathmandu. 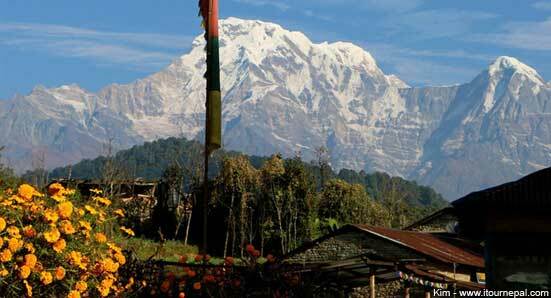 A gentle walking holiday in the foothills of Nepal Himalaya with stay in luxury resorts / hotels. A helicopter flight is the best way of getting to Everest Base Camp without much effort and time. In 3 hrs long flight, you can land at the Everest Base Camp or Kalapatter and have breakfast in Everest View Hotel. The 1 hour regular flight is the best way to see Mt. Everest while you are in Nepal. The flight takes off from Kathmandu and hovers along the eastern Himalayas offering magnificent view of Langtang, Gauri Shankar, Cho You and the Mt Everest.